Crypsis is artist Dirk Westphal’s latest series of photographic collections showcasing artificial colors. While previous bodies of the artist’s work feature the eye-popping hues of such consumer products as toothpaste, nail polish, and prepackaged desserts, Crypsis is Westphal’s homage to the beauty of plastic caps. Photographed in hyper detail on glowing white lightboxes, plastic caps of different shapes, shades, and sizes are transformed into vibrant kaleidoscopes of color. 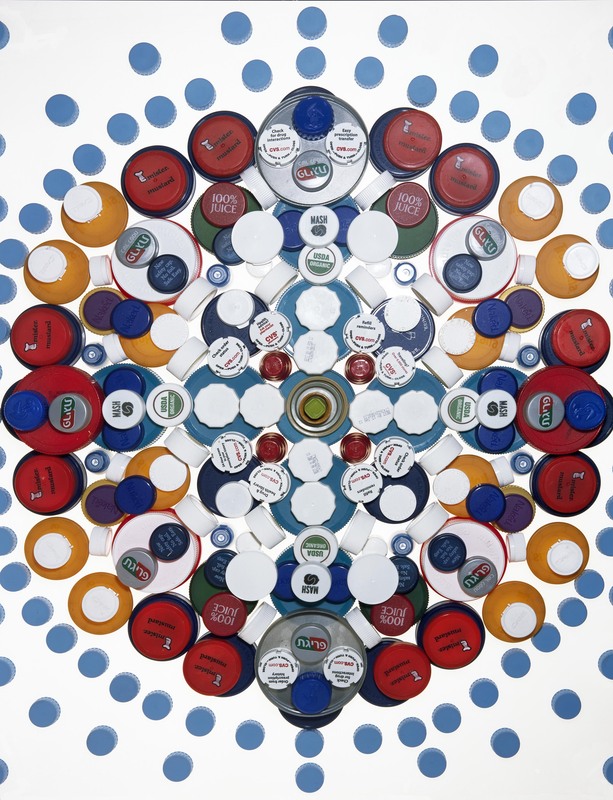 The project began with a small collection of plastic caps Westphal amassed for recycling while on vacation with his wife and young sons. Impressed by the quantity and array of caps he’d collected in just a few days, the artist continued to acquire plastic caps from family and friends over the next several months. Sorted into massive piles by color, type, and other personalized features (e.g., child resistant or ‘K’ for kosher), the caps in Westphal’s collection were striking. Westphal placed them on lightboxes and assembled them into largely color-themed sculptures before photographing them, exhibited at Cuchifritos in Crypsis. In arranging his plastic caps to be photographed, Westphal experimented with designs that were largely intuitive. Some of the designs are based on classic geometric shapes as in Flame (Universe), others directly mimic Persian rug motifs (Burrdock Version 2.0), and still others reflect various influences with a strong dose of psychedelia (Tetris). Taken with a large format camera, the photographs depict the plastic caps in great detail, while the glowing white background removes virtually all shadows. Overlapping and backlit, different shades of the same color alternately accentuate and camouflage one another. Crypsis is ultimately a study in camouflage and countershading. Crypsis is comprised of a video and nine prints. The photographs were taken on positive film using a 4×5 camera. Westphal scanned the film at high resolution and used an inkjet printer to produce digital prints from this file. Prints were subsequently laminated to UV-inhibitive plexiglass. All prints are in editions of 5 and dated 2014. Dirk Westphal received an MFA from California Institute of the Arts and is widely collected, shows internationally, and has been active on the lower Manhattan art scene since 1989. Thaddeus Briner acted as the curator of these particular pieces. He is an architect and his firm is called ArchitectureOutfit.